This single storey manor house that dates back to the 16th century was extensively restored with great care paid to retain the original interior that features Spanish marble and beautiful antique furniture. The small hotel lies on a hillside amidst wonderful gardens. 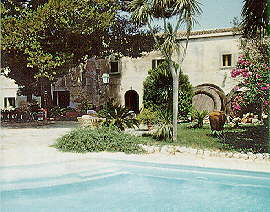 In the outdoor complex guests will find a swimming pool as well as a sun terrace. Sports enthusiasts may enjoy a game of tennis (additional fees apply) and the nearest golf course is approximately 12 kilometres away.